Well it started to snow here around 3 am on Friday, and it snowed, and snowed, and snowed, and snowed etc. Of course the wind was also blowing very, very hard. 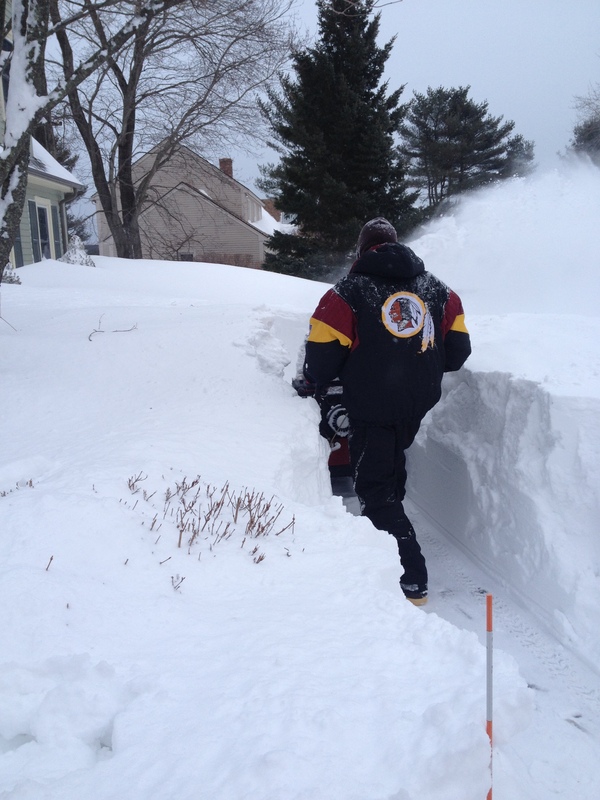 We were all set – we had been to the grocery store, we had food, water, WINE, a generator, gas for the snowblower. So we settled in and watched it pile up and oh my word it did. 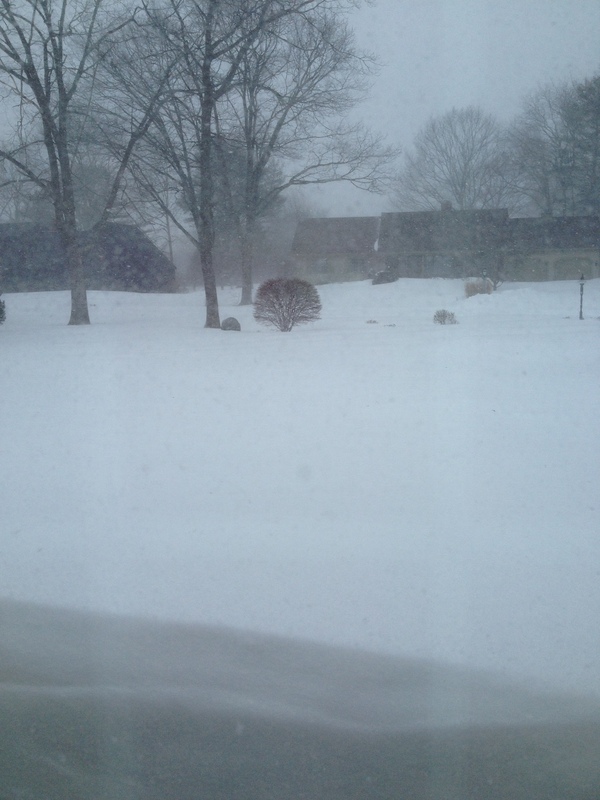 It is practically impossible for us to measure how much snow we got because it was blown all over the place. The wind blew so hard that it made it very difficult to sleep – it was very noisy. We were up early Saturday morning – anxious to see what had been dumped on us over night. There were spots in the yard that had no snow and spots where it seemed to be over 6 feet deep. We waited until Saturday afternoon to get started. The wind was still blowing very hard but for the most part the snow had stopped. We bundled up in our warmest layers and headed outside. 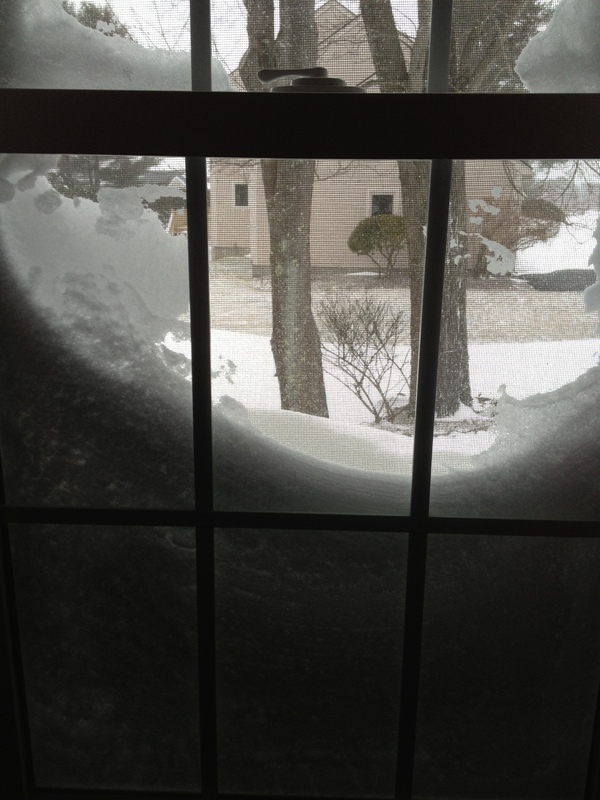 This is the view from inside the garage – Chuck had climbed out the mudroom door over the snow drift to an area on the driveway where there was only a few inches of snow. 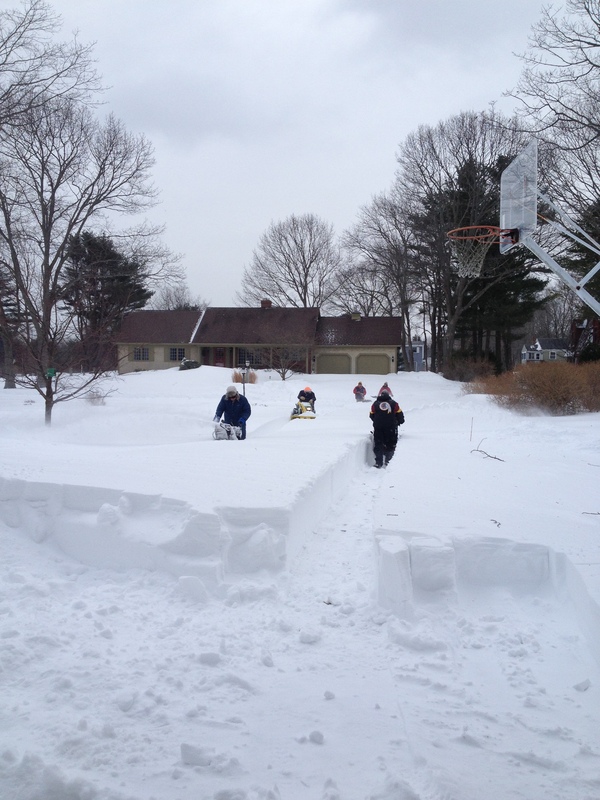 Our wonderful neighbors came and helped us dig out – then we all moved down the street to do several more neighbors. 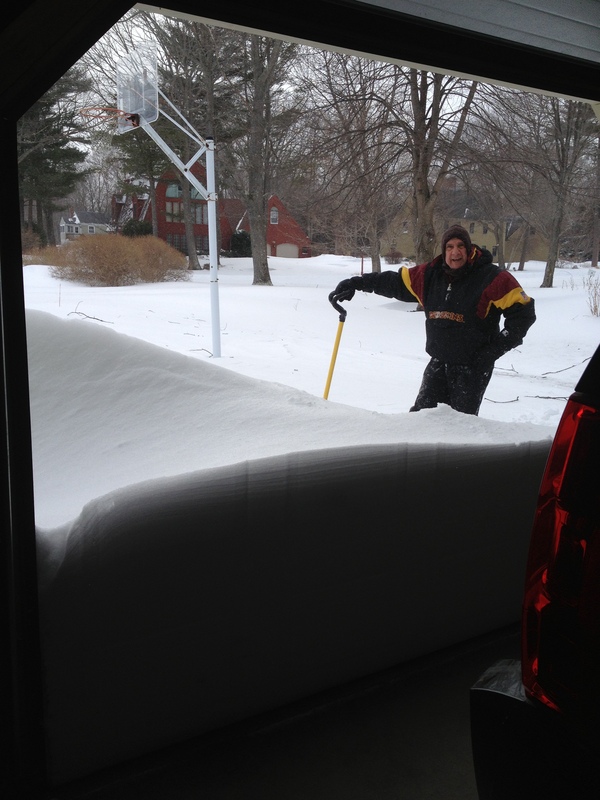 All in all over the two days we cleared 5 driveways and cleared paths for the oil men to be able to make deliveries. That is what Chuck is doing here…. 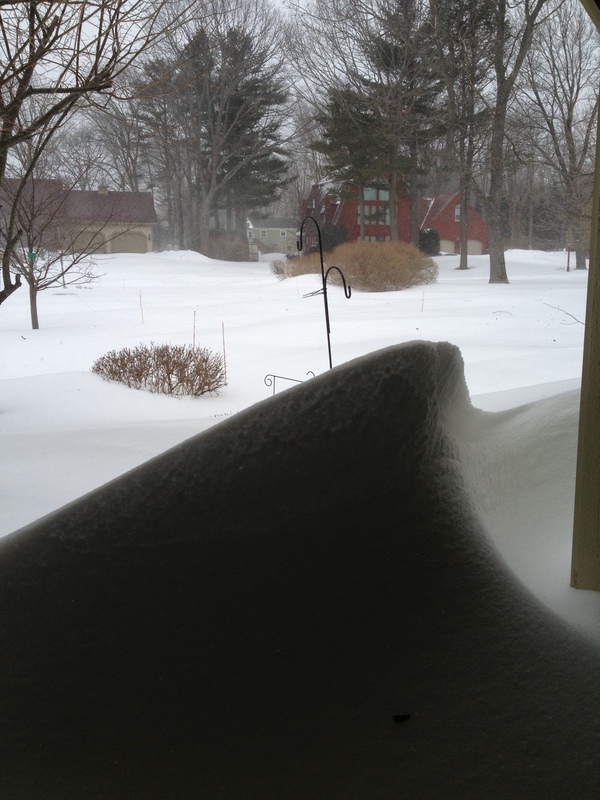 The snow drift in our front yard was probably 6 ft high – hard packed snow. This is what a neighborhood is supposed to do – group together – work hard – have fun and get it done. It is fun to pay it forward and do for others. We are all a little bit stiff today but we all have decided that the work we all did together was fun. Thank you residents of Channel Cove for helping us have fun playing in the snow for lots of hours this weekend. ← The Best Laid Plans….OOPS! Wow, We love the pic of Chuck…looking into the garage ! Great photo! Glad you have nice neighbors up there! We are blessed with really great neighbors! Lots of fun too!